With little time to spare and a painting project to tackle, choose a paint sprayer with the right pump, tip, and features to get the job done fast. If you’re looking for a way to speed up a paint job, look no further than your choice of an applicator. Indeed, there’s one clear winner: the paint sprayer. It’s estimated that a paint sprayer can apply a coating four times faster than rolling and a whopping 10 times faster than brushing. More than just time saved, though, paint sprayers also promise a more uniform finish (i.e. zero brush strokes) and easy application in tight areas. But with a price range as wide as $70 to $400, it’s no wonder that you wouldn’t pick one of these machines up for any old one-off paint job when a new roller kit would set you back less than $15. To get the best bang for your buck, you need to weigh your options carefully; for that, we’ve got you covered. Ahead, we’ve outlined key considerations for selecting the best paint sprayer—the precise combinations of a pump, gun, tip, and hose—for you and your projects and even rounded up three top-rated models worth checking out. Heavy-duty professional sprayers are often used for whole-house interiors. These paint guns use high-pressure air from a compressor to atomize the paint or stain and provide a fine finish. Consumer products, or “airless” sprayers, are electric- or gas-powered products that mechanically pump paint or stain into a sprayer. Fluid is pushed through the tip, causing it to atomize and become a spray. Spray tips vary and are chosen based on the type of fluid used, the surface to be sprayed, and the power of the spray gun. If speed is your priority, consider horsepower. “The larger the horsepower, the more gallons per minute and the faster the project gets done,” says Steve Mahacek, e-marketing/PR manager for Wagner Spray Tech Corp. But don’t get more power than you can reasonably handle. The type of coatings you intend to use also plays a role in selecting a sprayer’s power. Sprayers are rated for the pressure they produce and the tip size they can support. Units with more pounds per square inch, gallons per minute, and horsepower will also have the option for a bigger tip that’s needed to spray thicker coatings. A paint gun that does not have enough force to handle a larger tip may have problems with clogging. Project size also determines how much power you need. A large project requires a broader spray pattern and more pressure behind it. A smaller project may only need a self-contained handheld unit. When comparing paint sprayers, you’ll often see that manufacturers advertise tip size and number of spray patterns to distinguish one model from another. • A sprayer’s tip size can refer just to the size of the opening, as in a .015 tip. It might also indicate the fan size in inches, along with the tip opening, such as a 515 tip. In this example, the spray pattern will cover 5 inches and the tip opening is .015. As with power, the coating to be sprayed also guides the tip size. 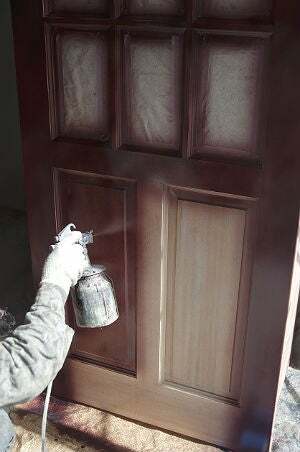 Coatings can be thinner (like stains) or thicker (like exterior latex paint). Stains require smaller tip sizes and less pressure, but paints and heavier coatings need larger tip sizes and more pressure. 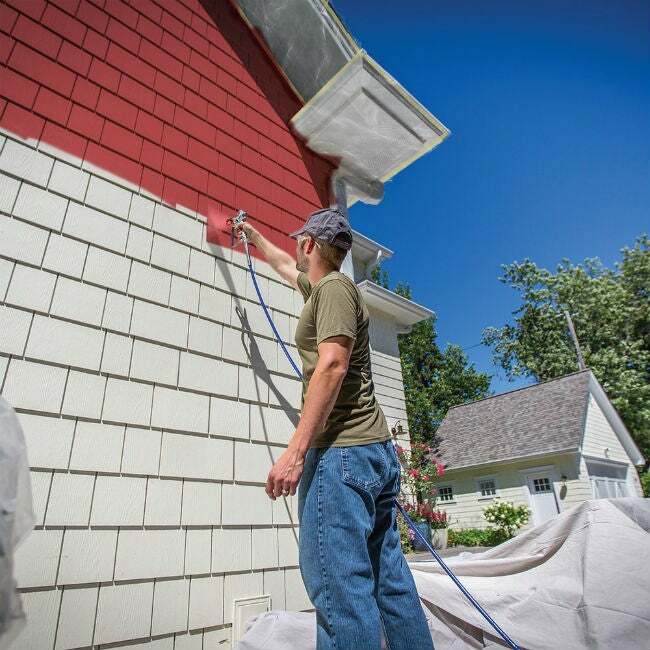 Consider the jobs you will be tackling, and pay attention to the manufacturer specifications for any given sprayer’s maximum recommended tip size—if you’re working on painting a home exterior, for example, you’ll need to find a sprayer with a considerably larger maximum than if you only plan to paint furniture. Most paint sprayers will expressly address what coatings they handle, but for reference, the typical exterior latex sprayers may come with a .015 tip and accommodate a 0.17 tip. • The spray pattern is the shape in which the fine particles of paint or stain come out. Typically, you’ll see sprayers featuring three patterns: round, horizontal, and vertical. Though the latter are merely different directions for the same fan of spray, having both available means that you can switch from spraying a 6″-wide fan across a surface to a fan of the same width moving up-and-down without turning the entire gun; instead, you merely twist a knob on the nozzle. Tips wear out, and when they do, the flow rate increases but the fan width decreases, which means more paint is spraying over less surface. Tips also come standard or reversible. A reversible tip can be unclogged easily by turning it around and blowing out the blockage. Depending on the size of sprayer you require and the quality of the machine, a paint sprayer can cost you anywhere from $70 to $400. (Those built for ongoing use make up the higher end of that spectrum, starting around $225.) For a project that can be done in one day, renting may be a wise workaround; this typically runs between $70 and $100 a day. Not only is it cost-efficient if you don’t have multiple paint jobs on the horizon, but rental units tend to be higher-production machines and won’t require long-term storage space after the project. Sprayers require respect. Always read and follow the manufacturer’s safety, setup, and operating instructions. Use a respirator mask and proper eye protection when spraying, and never spray at a person, animal, or window. 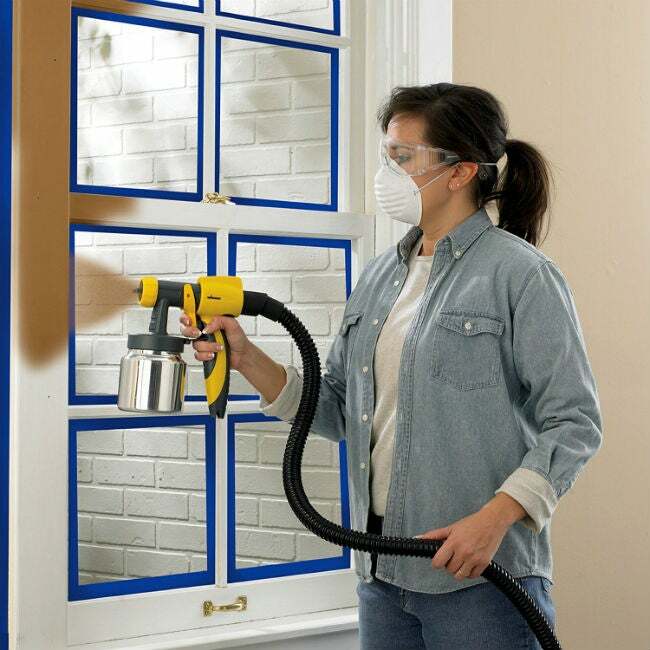 Cover or mask off anything in the vicinity of your project, including windows and trim, because vaporized paint gets into everything. If spraying outside, cover plants and avoid painting on windy days. • Sprayers with 25 feet or more of flexible hose or a long extension cord are best for jobs that require distance, like painting a fence. An extension cord makes cleanup even easier at the end of the job. • If you need to carry your paint supply a long distance, consider a unit with wheels or a backpack. • Determine your paint capacity and how often you’ll need to refill. You might opt for a larger hopper or a unit that draws straight from the can. • Think about cleanup and whether you want a unit that comes apart for easy cleaning. Smooth interior surfaces and units that draw from the can make cleaning easier, too. • Consider an adjustable pressure control with high, low, cleaning, or roller settings to help extend the life of your spray tips. A model that comes with a pressure roller attachment can also take over on projects where spraying isn’t possible (it, too, applies paint up to four times faster than a traditional roller and with less mess!). • Note whether or not the sprayer takes tip extensions—a handy feature when painting high ceilings, foyers, and hard-to-reach spaces. • Make sure replacement parts are available. • Check that there are digital how-to manuals, online resources, or support lines for your product. To speed up your trip down the paint sprayer aisle, we’ve hand-picked some of the top-rated paint sprayers on the market based on the above criteria, rankings by third-party product testing sites, and product ratings from do-it-yourselfers like you. Check out three of the best paint sprayers today. Boasting a 20-foot-tall flexible hose, this 11.2-pound, 110-Volt air-driven electric sprayer unleashes a high volume of air at a low pressure to make light work of interior and exterior painting projects. The sprayer’s 1.5-quart capacity hopper and two-stage turbine let you spray a large volume of finishes as viscous as latex paint or as thin as wood stain. And, with a simple twist of the ears of the air cap, you can spray all of these finishes in a vertical, horizontal, or round spray pattern. There’s no need to worry about cleaning too much errant paint after the job is done since the sprayer’s variable air pressure control, ranging from 1.50 to 2.63 psi, reduces the risk of overspray. Try the unit rated 4.1 out of 5 stars by Amazon customers yourself on any task from priming and painting cabinets to staining decks; it comes with a one-year warranty. Available on Amazon. Got some larger tasks on your to-do list? A Tool Nerds’ top pick among airless sprayers, this heavy-duty, 36-pound spray unit features adjustable pressure, a stainless steel piston pump, and a flexible suction tube that let you spray paint at your preferred rate of flow directly from a one- or five-gallon paint can without first thinning it. The built-in wheeled cart on the unit allows you to lug paint cans to spaces indoors and out, near or far, while the 25-foot flexible hose allows you to lend a fresh coat even to traditionally hard-to-reach surfaces like tall fencing or the siding on a multi-story house. Then, when it comes time to clean up, simply connect the sprayer to a garden hose! Yet another reason Amazon customers gave it 4.5 out of 5 stars is its capacity for high workloads: The sprayer, sold with a one-year warranty, is rated for use for up to 125 gallons of paint annually. Available on Amazon; similar models from Graco are available for rental at Home Depot. Amazon’s best-selling paint sprayer—a 3.9-star-rated, 3.3-pound air-driven, electric sprayer with a two-year warranty—punches well above competitors in its weight class. 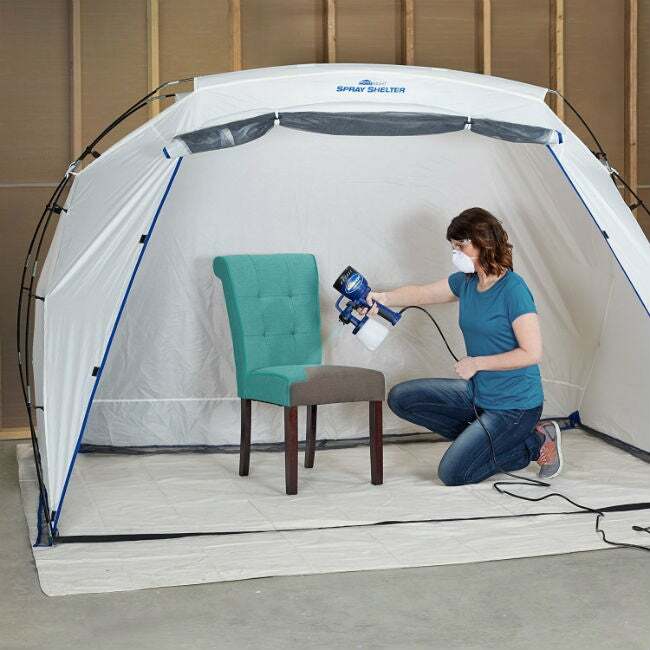 The HomeRight paint sprayer boasts a 400-watt potential that’s ideal for painting small to medium interior pieces ranging from furniture and cabinetry to dressers without the need for a compressor. 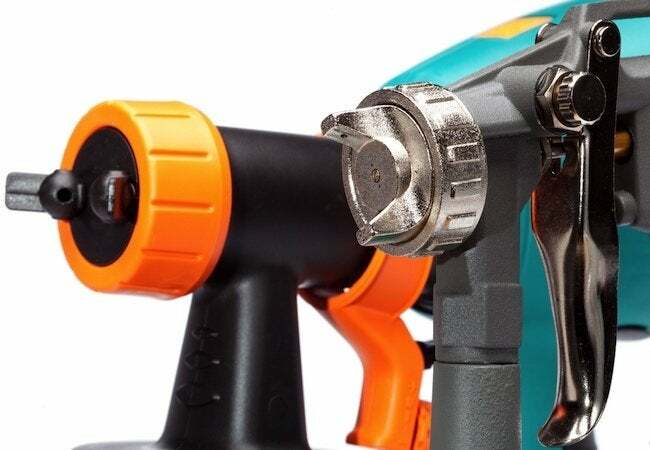 The adjustable air cap unleashes a high volume of air at low pressure to allow more paint to reach these surfaces, while the twist-and-click adjustable nozzle allows you to spray on a smooth, factory-like finish using a vertical, horizontal, or round spray pattern. Once you’ve achieved a look you love, clean-up is as easy as filling the spacious, 27-ounce hopper with water and spraying it until the water runs clear. Available on Amazon. Additional reporting by Manasa Reddigari.